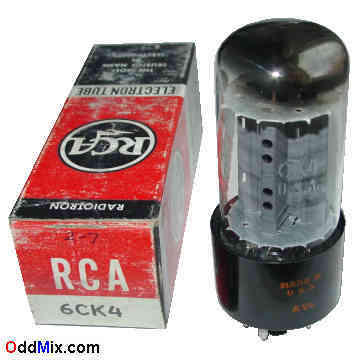 This is a genuine, original RCA Radiotron 6CK4 Low-Mu Triode radio electron tube. Developed for vertical deflection amplifier applications and Class A amplifier use in receivers and various amplifiers as a high power triode. Excellent for replacement, antique radio, instrument, TV television restoration projects, experimentation, circuit research or to set up a private vacuum tube museum. It is NOS tube - New Old Stock, unused, boxed, excellent condition. First come first serve, one rare, discontinued, historical vacuum tube available!